What makes someone a big fan of your nonprofit? It’s not that different from what makes someone a big fan of a sports team. 1. There’s an Emotional Connection. Your cause touches something deep inside of them and makes them willing to do crazy things for you. Sports fans paint their faces and wear weird costumes. Your fans might host a party in their own homes, invite all of their friends over, pay for the food, give you the floor to talk about your cause, ask their friends to empty their wallets, and write another big check themselves. Or they might do the online equivalent, such as placing one of your fundraising widgets on their own blogs and emailing all of their friends about you. 2. They Believe They Matter. They believe their actions will have a real impact – and you can’t do it without them. Fans bring signs and cheer and chant, because they believe it will inspire their teams to play better. Your biggest fans also believe that their support really matters – that they are making it possible for you to do your best and to bring about real changes to make the world a better place. 3. They Want to Belong. They want to feel like they are part of something bigger than themselves. 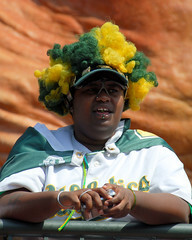 Sports fans dress in the team colors and do the wave. Your biggest fans also want to feel like they are part of something bigger by seeing how their individual contributions, combined with others, can produce something amazing. They want to feel like they are real, valued members of your team. 4. It Feels Good. They get off on the Helper’s High. Sports fans party in the stands, hanging out with friends and having a good time. Your fans get a boost too, because giving feels good, both emotionally and physically. PreviousPrevious post:Magic Keys Radio Today on Pitching + Mixed Links You Can’t MissNextNext post:Should Your Nonprofit Host a Fundraising Event or a Party?